You should make demos for this! Steal our source code and VGA schematics: http://aka-san.halcy.de/revision2012/peridiummmm-src.zip. The board can be had for about 14 Euros at various suppliers, just add a bunch of resistors for VGA. Great greetings-part. Other effects ruled as well. Great effects! Especially the splines (or something) in the greetings part were very nice. let's hear it for new platforms and coda music! thank you! I wrote the greetings, they were my first demo effect. Yes, bezier splines. Yep the effect at greetings part is great, this oldschool demo has a very nice flow. Embedded rules, greetings rule - thumb up! The palette on the VGA adapter is set in hardware by resistor values, and contains only coder colours. Ignore the guy who came up with the resistor values up there, the colours are totally not coder colours, they are cute and pop. Great visuals (yes cute and pop colours^^) , cool effects and a great chip tune which I`ve just recorded from the video to add it to my playlist. Only small point of criticism: The spike ball in front of the star field is too small in the scene from 1:18 to 1:29 and the scene lasts too long until the pink ring appears and saves it. I saw nice demos at Revision, all great and impressive, but this small little gem is my personal favourite of the whole party. And yeah, one of the best greetings parts ever. yay for low-cost demo platforms! 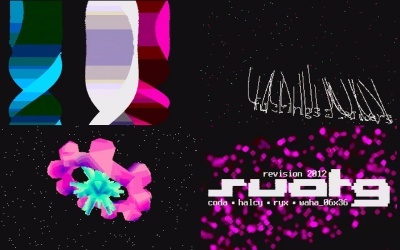 just like LFT's entry this one has real nice chipmusic coupled with some, well, average screen design. For bit-banged VGA, this is flipping awesome. I'm quite surprised it didn't place higher in the compo actually! very cool and the greetings part rocked. Ah yes, this. Really great and cool design and music. Well done in all aspects. Well done, indeed greetings part superb. Really awesome tune. Also the whole production has this "cute chippy party"-feeling. Should have placed at least 3rd. Greetings party is really great and made the crowd go "Whooooah", including me. rulez added on the 2012-04-30 18:35:19 by JAC! rules hard! should have won! Very impressive. Awesome effects too. should have ranked higher indeed. i really like it. especially the greetings-part rulez! rulez added on the 2012-06-16 16:21:28 by ɧ4ɾɗվ. Haven't voted for this already? Not as impressive technically as LFTs entry, but really nice demo too. Some of the transitions are awesome. Very impressed! Some nice effects and great music.